How much does it cost to travel to Portugal? How much money will you need in Portugal? €98 ($110) is the average daily price for traveling in Portugal. The average price of food for one day is €29 ($33). The average price of a hotel for a couple is €87 ($98). Additional pricing is in the table below. These average travel prices have been collected from other travelers to help you plan your own travel budget. How much money do I need for Portugal? Portugal is on the Iberian Peninsula which it shares with Spain. It's a diverse country that has its own unique culture and a variety of beautiful natural landscapes. In particular, Portugal has the cliff beaches of Algarve, beautiful rural countryside, energetic cities, a traditional culture, beautiful lush green vineyards, and so much more. This beautiful country has managed to maintain its own unique rich culture while other nearby countries in Europe merge and modernize. It has rural areas that still feel a world away from the nearby cosmopolitan cities. There are parts of the country that still feel like you've stepped back in time. Even in the cosmopolitan city of Lisbon you can get lost of the back alleyways and catch a glimpse of a city that once was. 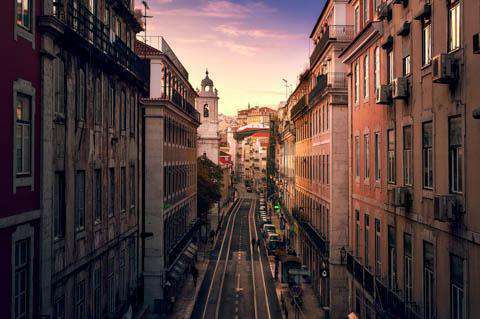 Portugal was once on of the most economically poor countries in Western Europe, but when the dictatorship ended in 1974 and it later joined the European Union, its wealth and modern amenities grew and began to thrive. Over the last few decades it has grown in popularity amongst tourist. International tourists frequently visit this fascinating city, but European tourists flock here, particularly during the cold winter months when they head south to escape the frigid temperatures. Beach towns are now filled with expats who've bought second homes in the area. With the crowds has come a significant rise in costs throughout the country. It is no longer the budget destination it once was, but it is still cheaper than most of Western Europe if you plan ahead and travel to the right places. To keep your expenses to a minimum during your trip to Portugal, try to avoid the more popular beach towns. Cities like Lisbon also tend to be more expensive than smaller towns and rural areas. Book your hotels and train tickets in advance and travel during the off season when the crowds are less and the prices are lower. One interesting tip is that most museums are free to the public on Sundays, so try to schedule any museums visits on this day. Also be sure and eat at restaurants that are at least a few blocks from popular tourist attractions as these restaurants will be less likely to target out of town visitors. Ask residents where they recommend you go for a good Portuguese meal and you likely won't be disappointed. Also be sure and enjoy dessert at any of the bakeries you'll find around town. Costa Vincentina National Park: This national park is a stunning cliff that dramatically drops into the water. It's a beautiful place to watch the sunset and a nice place to see the ocean. Fado Bars in Alfama: This neighborhood is a wonderfully historic area worth exploring in Lisbon. It goes down the hill between the Castle of Lisbon and Tejo River. Azores: This area offers a dramatic landscape that is filled with charming villages, beautiful valleys, and colorful flowers. Caldo Verde: Caldo verde is a soup dish made from potatoes, kale, and chourico sausage. It's often served during celebrations such as weddings, but it's also sometimes offered as a main dish for dinner. Bacalhau: This is a common Portuguese ingredient that is made from dried and salted codfish. It is common in many different popular dishes in Portugal and is most often used in Christmas dishes. Pastel de Nata: This is a pastry like tart made from eggs. It's similar to small pies that are filled with custard. It's available in bakeries throughout the country and has even spread to Macau and Hong Kong where it is a popular dessert with dim sum. Golf has taken off in Portugal and is common a major draw throughout the country. The Mediterranean climate in Portugal is ideal for golf and only recently the country was listed as the "Best Golf Destination" by Golfers Today. There are many courses if you're interested in learning golf. They're often taught by professional golfers, and they're very common throughout resorts. Classes are available for all skill levels, so anybody from a complete beginner to a long time player can benefit from a refresher course. Many people head to Portugal specifically for the beaches. They are beautiful and generally offer a nice variety of activities including surfing, kite-surfing, and even organized aerobics classes. You'll also never find yourself too far from a bar where you can escape the sun for a cool, refreshing drink. If you're looking for a popular beach, you likely won't be disappointed with Espinho which is in the north. Figueira da Foz is in the central regions, and if you're looking for something close to Lisbon, head over to Praia das Macas. Do keep in mind if you're in Portugal during the peak season, the beaches can be incredibly crowded and loud. If this is your style, you're definitely in for a good time.